When I was a camper, I do not remember my counselors ever reminding me to wash my hands before a meal. Nor can I remember bottles of hand sanitizer being readily available in the dining hall. I also do not recall learning the proper etiquette for sneezing and coughing at camp. The H1N1 flu has affected many camps this summer. At Tamarack Camps, protocols and preventative measures were discussed months prior to the summer. In consultation with the ACA (American Camp Association) and the CDC (Center for Disease Control), our health director, along with our doctors, nurses and medical committee, devised proactive implementation plans and executed them effectively. Dealing with extra health precautions this summer has certainly been a challenge. However, as every educator knows well, any situation can become an opportunity to learn. Concern for our own personal health is a core Jewish value. Many of the Torah’s commandments promote good hygiene, though their stated intention was ritual purity rather than physical cleanliness. In the Book of Leviticus, one learns how those afflicted with a severe skin disease were treated. In order to contain the skin disease (a form of leprosy), the afflicted were quarantined. They were kept outside of the community to prevent the contamination of the camp through the spread of their disease. The quarantine ensured the holiness of the camp and the health of the inhabitants. The Talmud records numerous references concerning the importance of personal hygiene and preventative medicine. In tractate Ta’anit, the rabbis consider the human body as a sanctuary. In honor of God, the rabbis ordained that one must wash one’s face, hands and feet – daily. In tractate Yoma, for example, the rabbis recommend oil as a hygienic agent, especially in the case of wounds and eruptions, as well as a gargle. The Shulchan Aruch, the premier code of Jewish law, explores the importance of personal hygiene in great detail. Washing one’s hands, our tradition teaches, is important not merely for the spiritual reasons of maintaining holiness when eating and praying, but also for hygienic reasons. Maimonides, a scholar and physician, encouraged the Jewish community to observe rules of personal hygiene, such as hand-washing before eating. This unfortunate strain of Influenza, which has put all overnight camps on high alert this summer, has created some teachable moments. Offering the Hebrew word "labriyoot" (to your health) when someone sneezes has a newfound seriousness this summer. A particularly meaningful part of the week at camp is watching campers pray for the speedy recovery of their fellow campers through the words of the misheberach blessing during Shabbat morning services, using the tune popularized by Jewish songwriter Debbie Friedman. And while campers may be discouraged from performing the mitzvah of visiting the sick when the patient is contagious, it is a valuable lesson which has developed into creating get well cards. The level of preparation displayed by Jewish camps has been exemplary. It is a testament to the emphasis we all place on good health and preventative medicine. Camp in 2009 is a place where it is common for campers to have their temperatures taken twice daily as a precautionary measure for early detection of the flu. It is a place where counselors constantly remind campers to wash their hands and brush their teeth, and where hand sanitizers are found on every table in the dining hall. It might feel like a time of challenging health issues, but it has also proven to be an incredible opportunity for teaching about the value of good personal hygiene. 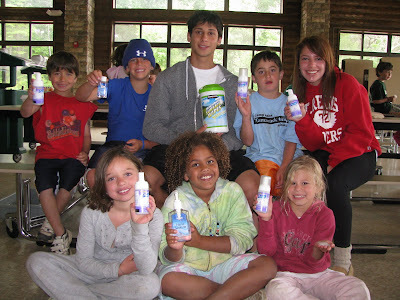 Hopefully, at the end of this summer, each camper will have a new found appreciation for cleanliness, good health, and the important Jewish value of hygiene. Very informative post. I also agree, that we should be clean and hygienic in order to keep ourselves from diseases and some illnesses.